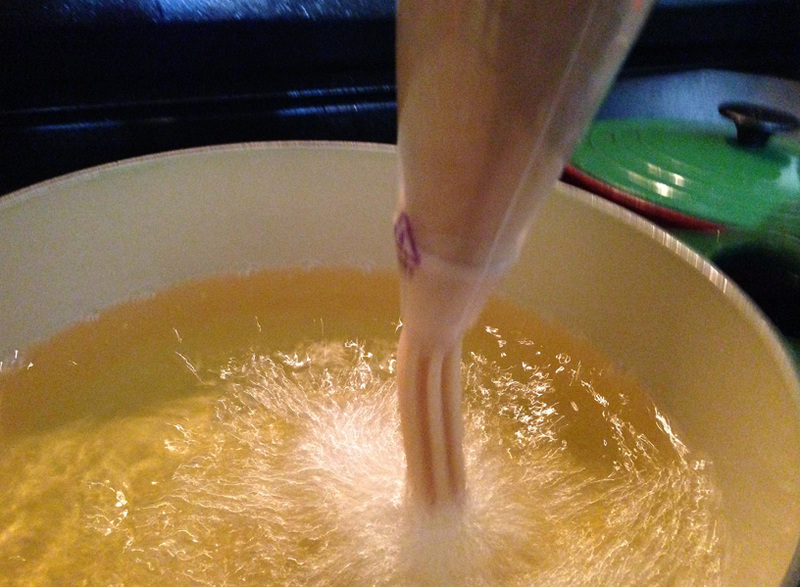 In celebration of Cinco de Mayo, I decided to try my hand at making churros. Crispy, chewy, cinnamon-y delicious churros. While I have enjoyed this delicious treat many times, it wasn’t until recently, thanks to the Cooking Channel, that I became obsessed with having them with chocolate dipping sauce. For me, a churro was a treat you got at the carnival or street fair, wrapped in wax paper, covered in cinnamon and sugar. I have heard of them being served with dulce de leche, but again, I never indulged. So, with a house full of extra chocolate, after having a hell of a day making candy, I decided to use the leftovers and make a sauce to go with my churros. I have to say, great freaking idea!!! 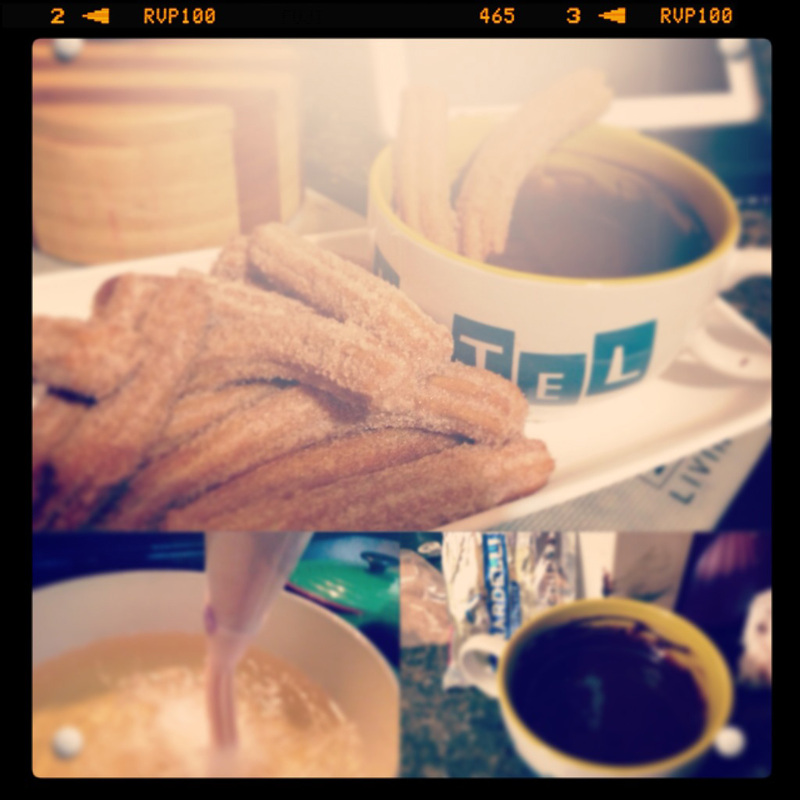 Here is what I learned today, making churros at home is beyond easy. Getting the mixture just right, so it cooks up perfectly, crisp on the outside, tender, and slightly chewy on the inside, is not so easy. 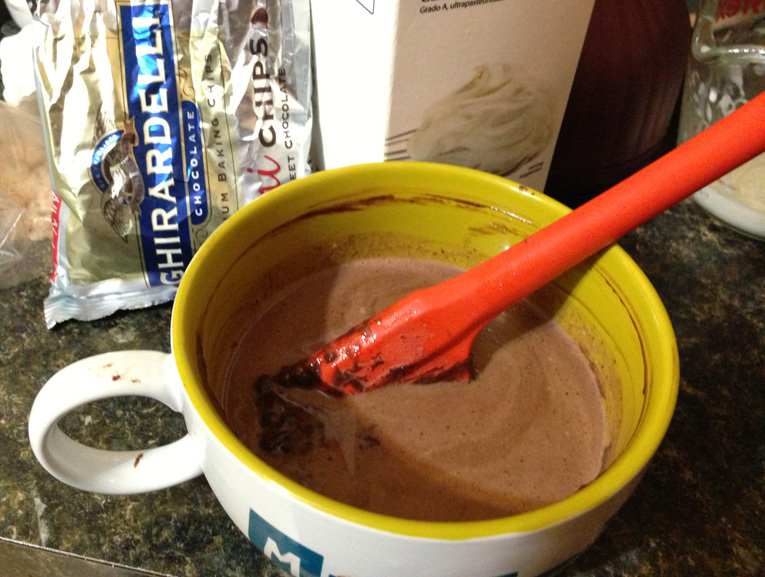 Through trial and error, I managed to tweak my recipe and come up with one yummy treat, if I say so myself…and I do. The key, to getting the right consistency is not to use too much sugar or oil. 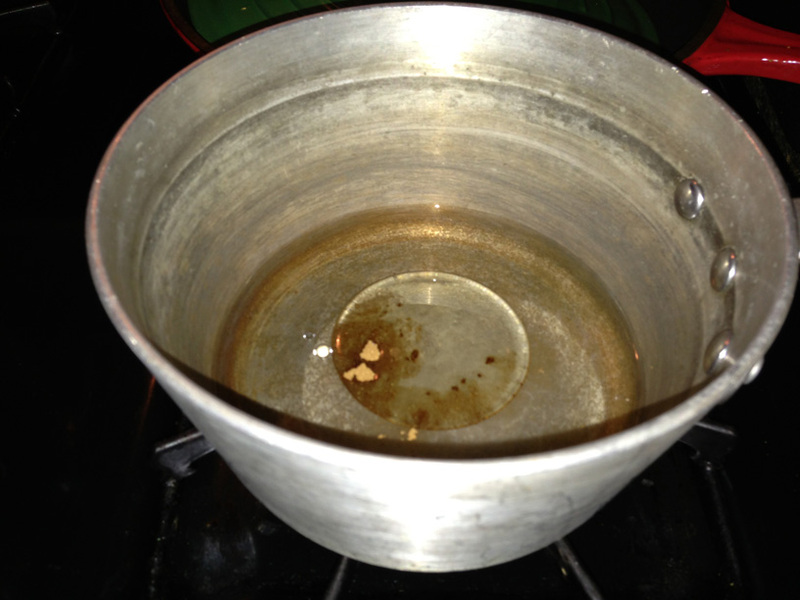 Sugar cooks to quickly and the oil slows down cooking the inside. Another thing that I do differently is season in every step. Most of the recipes I found only call for flour, sugar and salt. I found that the addition of Chinese Five-Spice and Vanilla, the churros had a more in-depth taste. It took me three batches to figure this out, but I did and I am now ready to share with you, my version of churros. In a large heavy bottomed pan (I use my Le Creuset dutch oven) heat oil for frying. Oil should be about 2 inches deep. In a saucepan, add water, sugar, salt, Chinese Five Spice, vanilla and oil. Heat to boiling, then remove from heat. 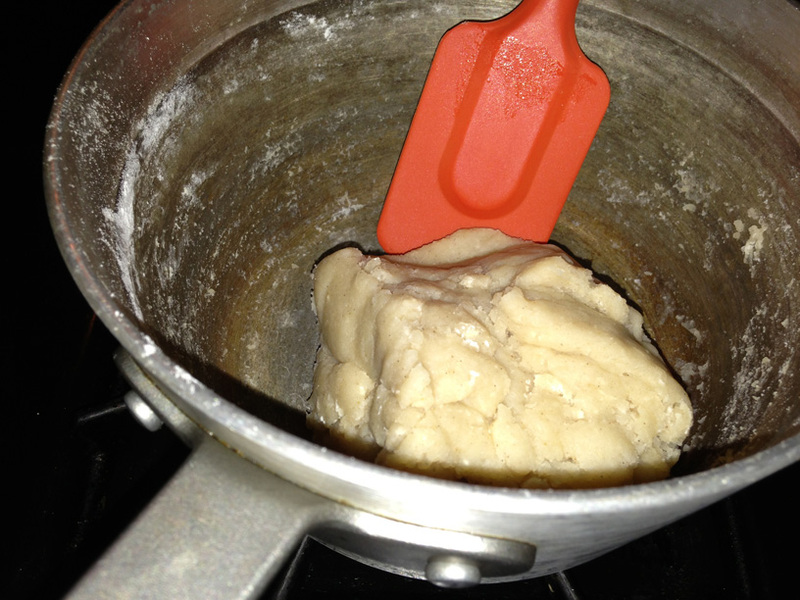 Add flour and mix until a soft dough ball forms. Fill pastry bag fitted with a large star tip with dough. 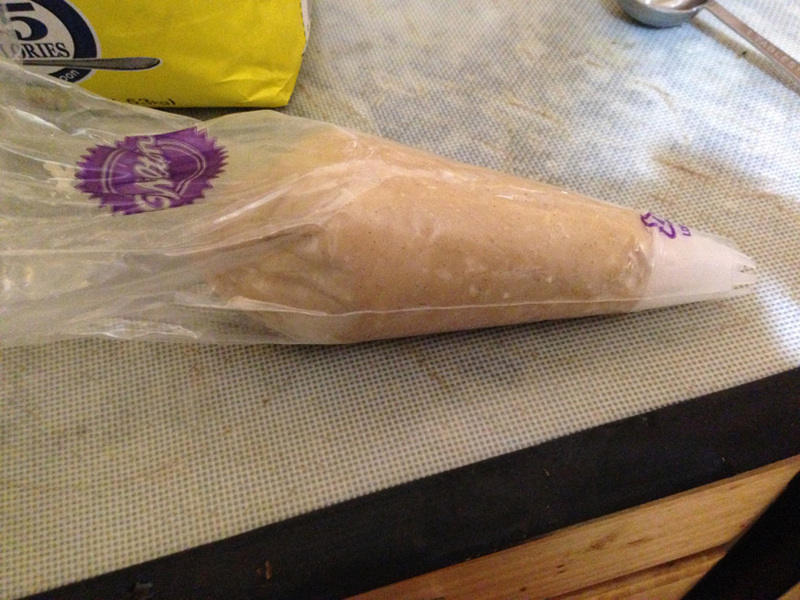 (Note: if using disposable bags, double them up, dough will be hot!). Gently squeeze dough into hot oil, use scissor to snip pieces. BE CAREFUL!! Do not drop dough into hot oil, or it will splash up and burn. 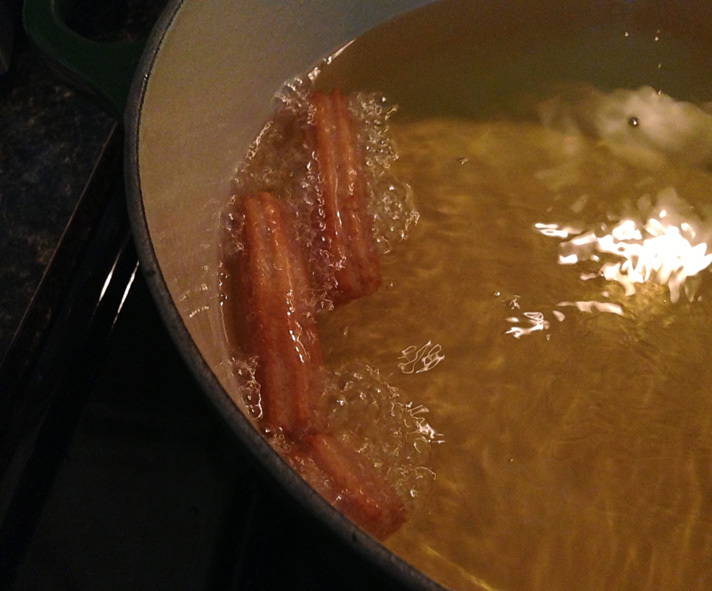 Once churros are done, remove from heat and drain on a paper towel. Shake churros in cinnamon-sugar mixture and coat well. Heat cream in microwave for 90 seconds, be careful not to let it boil over. Pour over chocolate chips. (It will look like a bowl of chocolate milk). 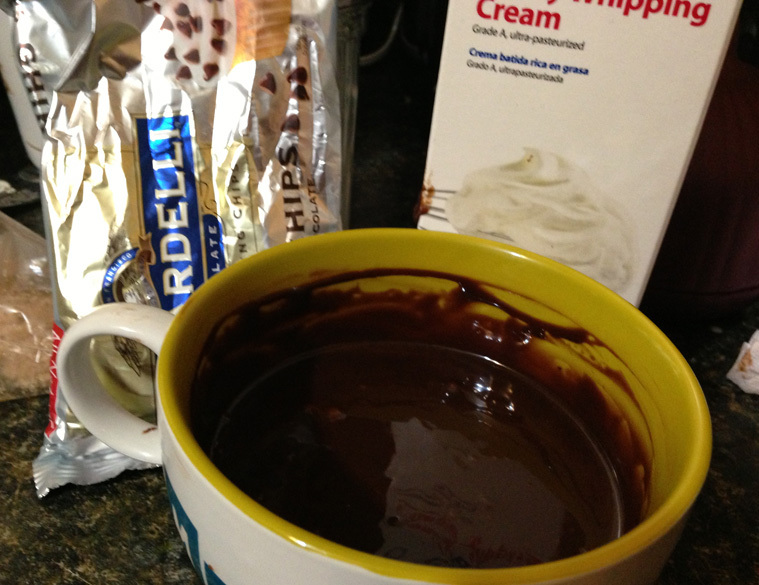 Let sit for one minute, then stir until chocolate is melted and sauce is smooth. 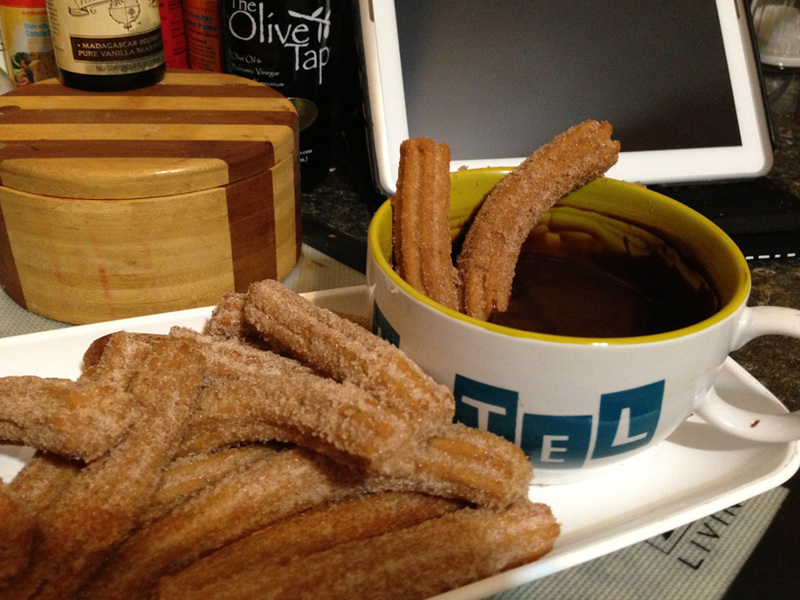 Serve churros warm with chocolate sauce.